The birth of Factory Outlet is an interesting story. This started from the monetary crisis that occurred in the 1990s. Because at that time the economy was slowing down, the trade also became sluggish. 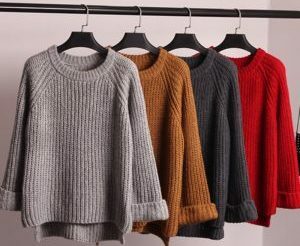 Many clothes targeted for the export market were not sold successfully. This situation led to the idea of establishing a Factory Outlet. Thus Factory Outlet is a clothing business with the concept of selling the remaining stock of clothes from the factory with low prices. At that time, FO was the brilliant solution to the economic crisis because it also provided employment. As time is passing by, Factory Outlet is growing as well. Currently there are even some Factory Outlets which have their own clothing factory. They produce clothes and simultaneously distribute them. In terms of production, most Factory Outlets is oriented to the emerging trends in the rich countries such as South Korea, Japan, Europe and America. They try to adapt this trend by adjusting fabric material against weather conditions in Indonesia. Every Factory Outlet strives to have its own image so that imitation can be avoided among them. In addition to image, most of the time the difference between one Factory Outlet with another lays on the model of clothing that it sells. Therefore some Factory Outlets make a clothing model with certain characteristics. The model is made in various sizes and sold for a certain period, for example two weeks. Even so this period is flexible. If there is increase in market demand, the model can continue to be produced and sold. So practically Factory Outlet can be classified into two major groups. The first is Factory Outlets which exclusively produce or sell clothing with limited design and production. The second is Factory Outlets which produce or sell clothing according to market trends. Factory Outlet is very popular in Indonesia including in Yogyakarta. During holidays or weekends, people come to shop at Factory Outlet even though it can be said that the customers are mostly the upper middle class. They really like clothing with export quality and affordable at the same time. For example, clothes that normally at the mall have the price around Rp. 240,000 can be found at Factory Outlet at a price of around Rp. 80,000. Surely you can save a lot of money. Yogyakarta is a big city and main tourism destination. In addition to Yogyakarta shopping streets, you can easily find Factory Outlets in Yogyakarta. Some of them are well known among locals and domestic tourists. Let’s find out. Omah Mode is one of the top places to hunt stylish and affordable clothes in Yogyakarta. It’s a must visit. This factory outlet provides clothing, shoes, bags and other fashion items. Most of the collection is for women, but there are also men and children’s section. Located on Sabirin Street, Omah Mode is also easily recognizable by its characteristic building which is an old and antique building from the Dutch age. Even though it already offers affordable prices, Omah Mode also has sale at certain times to attract buyers. Omah Mode is located at Sabirin Street, No. 22, Yogyakarta. Opening hours is 9 am – 9 pm. Outlet Biru is one of the famous Factory Outlets in Yogyakarta. Every day hundreds of people come shopping here. The price of goods is relatively cheap, even for students. There are various fashion items offered here such as shoes, hats, clothes, bags and other accessories. At certain times, especially during national holiday, Outlet Biru will have sale. You must not miss it. Anyway, If you don’t like crowds, you should shop at night or morning because afternoon is usually the peak time. Outlet Biru is located at Wahid Hasyim Street, Selokan Mataram, Yogyakarta. Opening hours is 10 am – 9 pm. De Kosmo is one of the largest factory outlets in Yogyakarta. 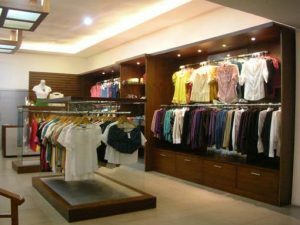 De Kosmo specializes in women clothing, nevertheless children and men can also find their outfits here. De Kosmo is located at Magelang Mlati Street, Sleman, Yogyakarta. Opening hours is 9 am – 9 pm. 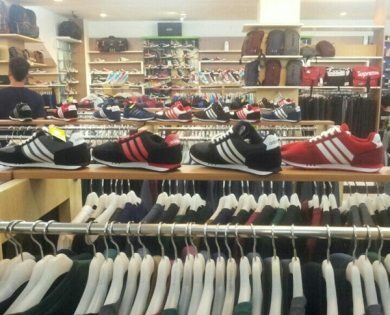 Direct Factory Outlet Yogyakarta guarantees all its items are of high quality, made with unique design and have fair prices. They also have a policy of guaranteed satisfaction. 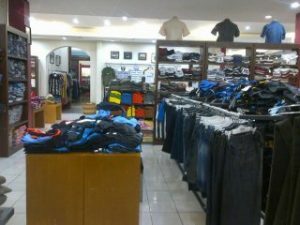 In addition to direct purchases at the store, Direct Factory Outlet Yogyakarta also serves online purchases. 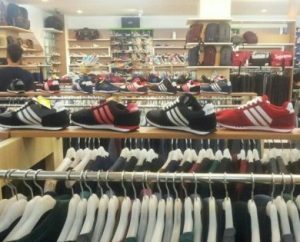 Direct Factory Outlet Yogyakarta is located at Ahmad Yani Street, No.88, Yogyakarta. Opening hours is 9 am – 9 pm. Borobudur Knitting Factory Outlet was founded in 2002 and manufactures various kinds of knitwear for women’s clothing, men’s clothing, and accessories such as shall, hats, and others. In addition to ready to wear clothes, customers can also order clothes or accessories with their own custom designs. Borobudur Knitting Factory Outlet is very concerned about the quality of its products. It guarantees each of its products always has a sense of comfort and softness. In 2015, it developed children’s knitwear with the brand “Kiddi-kiddi”. Until now Borobudur Knitting Factory Outlet has 25 branches spread in various major cities in Indonesia. Borobudur Knitting Factory Outlet is located at Menteri Supeno Street, No. 41, Umbulharjo, Yogyakarta. Opening hours is 9 am – 9 pm. More Factory Outlets in Yogyakarta. 12. Cargo Factory Outlet at Kaliurang Street, Km. 5.5, No. 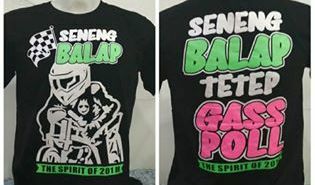 44, Sleman, Yogyakarta. Besides shopping, you have other things to do in Kaliurang . 15. Guess at Mall Malioboro, Malioboro Street, Yogyakarta. Check other things to do in Malioboro. All right guys. Now you have the list of Factory Outlets in Yogyakarta. Bring your wallet and let’s hunt the stylish outfits.